Although I had tons of official Zentangle tiles purchased from Zentangle.com, for months most of my Zentangle work was done on comparatively inexpensive 3.5-inch square tiles from Peter Pauper Press that I purchased from Amazon. I was urged to use more of the “official” tiles by other tanglers on the Zentangle Mosaic app. 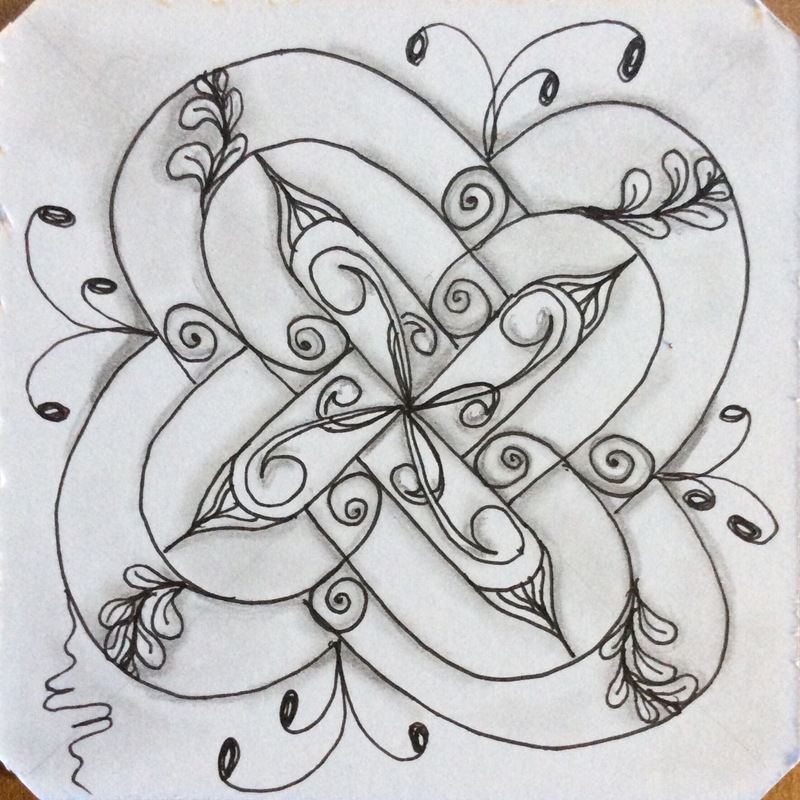 The reasons given ranged from “you’re worth it!” to “it’s easier to work on the Zentangle tiles,” with lots of other reasons in between. For weeks now, I have been doing more and more tangling on the official tiles and less and less on what I now refer to as practice tiles. More and more often, I have been using the practice tiles to try out new ideas or newly learned patterns. All my meditative tangling and mastered patterns are now done on the tiles purchased from the Zentangle site. What’s the difference? There are a lot of differences, starting with the quality of the paper and how it feels to tangle on the different surfaces. Zentangle (more expensive) tile was used for this version. PPP (less expensive) tile was used for this version. Let me start with the price and why I did most of my work on the Peter Pauper Press tiles. The “official” Zentangle tiles cost $29 for 55 tiles from the Zentangle web site, plus postage. These can also be purchased from CZTs (Certified Zentangle Teachers). The price on Amazon for the PPP tiles is currently $5.53 for 75. Even if I didn’t have postage-free Amazon Prime benefits, the PPP tiles have a serious price advantage. The official tiles work out to about 53 cents a piece while the PPP tiles come out to less than 7.5 cents each. I get 7 of the less expensive tiles for the price of a single Zentangle tile. That’s quite a price difference! Just starting out, I felt this was a better option. I was wrong, by the way, and I will discuss why below. Recently, in an e-book on tangling on black tiles, the author suggested that the cheaper tiles are fine for work on white tiles, suggesting that they are interchangeable. But there are a lot of reasons why this is not quite true. As with most artist supplies, quality matters. The less expensive tiles are made from wood pulp and “post consumer products.” They are very smooth and lack absorbency, so that graphite sits on the surface while ink takes just long enough to dry that a fast tangler can smear the ink easily. Because the graphite has nothing to hold it, it is easy to accidentally rub the graphite over the surface where it is not wanted. It also takes more pressure on the pencil to leave a darker graphite line or shading. That makes the graphite line more difficult to blend out to hide a line while increasing the likelihood of smearing or “stamping” graphite. Since erasers are not used in Zentangle, smeared graphite can affect the finished work in surprising and often undesired ways. The more expensive, official tiles are 100% cotton fibers. Aside from the luxurious “feel” of the cotton fiber tiles, the surface is textured and holds graphite well, much like good quality drawing paper. That means a lighter application of graphite can be made, minimizing the obviousness of a drawn line. The texture also helps control how far out blended graphite goes. The cotton tile is also absorbent, so ink appears to dry faster, minimizing accidental ink smearing–except on larger and purposely black areas, but that’s for another discussion. The textured surface also adds a slight “drag” to the pen tip, forcing a lighter hand during drawing. That’s actually a good thing because easing the grip helps prevent hand cramping and actually gives more control over the width or heaviness of a drawn line. If color is to be added to the tangle, the cotton tiles have enough of a tooth to grab color from color pencils and markers, while the less expensive tiles require more work to achieve desired color effects. Color appears more vibrant on these tiles, too. If watercolor is used to marble the tiles before drawing or color in sections after drawing, the less expensive tiles buckle and become deformed without either prior stretching or weighting down the paper to flatten the work afterwards. The cotton tiles are of watercolor paper weight, and basically return to the original flatness after drying–without the need for stretching and flattening. While the texture of the less expensive tiles actually changes after water and watercolor application, the cotton tile remains pretty much as it started. Local weather and humidity affect the paper used to create. Here in Sint Maarten, in a very humid tropical climate, that makes a big difference in the way the paper behaves even before I start working. The cotton tiles are always flat when I take them out. The PPP tiles tend to have a slight curl to them, even though they are stored the same way and are weighted down between tangling sessions. When I started, I thought the paper quality would make little difference to the finished work. I could not have been more wrong! Aside from the differences noted above, I find that tangling is much more enjoyable on the more expensive cotton tiles. The tiny bit of drag to my pen helps me loosen up and concentrate on the effect I want to create. Tangling on the smoother surface sometimes causes skips in my lines or patterns when I use a light hand. It is also more difficult to control the width or heaviness of the drawn line without switching to a pen with a different size nib or tip. Shading makes such a difference in the overall result of the drawn patterns. The tooth of the cotton tiles allows greater control of blending out graphite with a blending stump or tortillion. The differences in blending are apparent when comparing the two tiles above. The cotton tile’s shading is softer, without the obviousness of where the graphite was laid down. On the less expensive tile, I needed a heavier hand to lay down the graphite, making the pencil lines obvious and less easy to blend out. It may be hard to tell, but it was more difficult to maintain control over curves and lines drawn in ink on the PPP tile. The surface is so smooth that the pen tip has a tendency to go out farther than intended. The smoothness keeps the ink from being readily absorbed by the paper, increasing the likeliness that I will smear the ink, and actually causes me to press harder on the smooth surface. The cotton tile almost pulls the ink from the pen, so that less pressure needed to be applied and I was better able to control the ink flow. Overall, I think I save money on Micron pens because less ink is needed to obtain the same effect as on the smooth paper. One last thing about the textured paper–it has a definite grain to it. It is easier to see the up/down and right/left of the tile when I am tangling. That helps to keep my lines straighter and grids more even. The complete lack of grain on the less expensive tiles makes me completely reliant on my eyes for straight lines and even distance. Because one works so close to the surface when creating on a small surface, it is easy for the eye to get fooled when drawing straight lines and grids. The grain helps me, anyway. Perhaps it is less important for someone else. Tangling on the cheaper tiles caused me to develop some bad habits, like tightening up on my pen and pressing too hard on my graphite pencil. 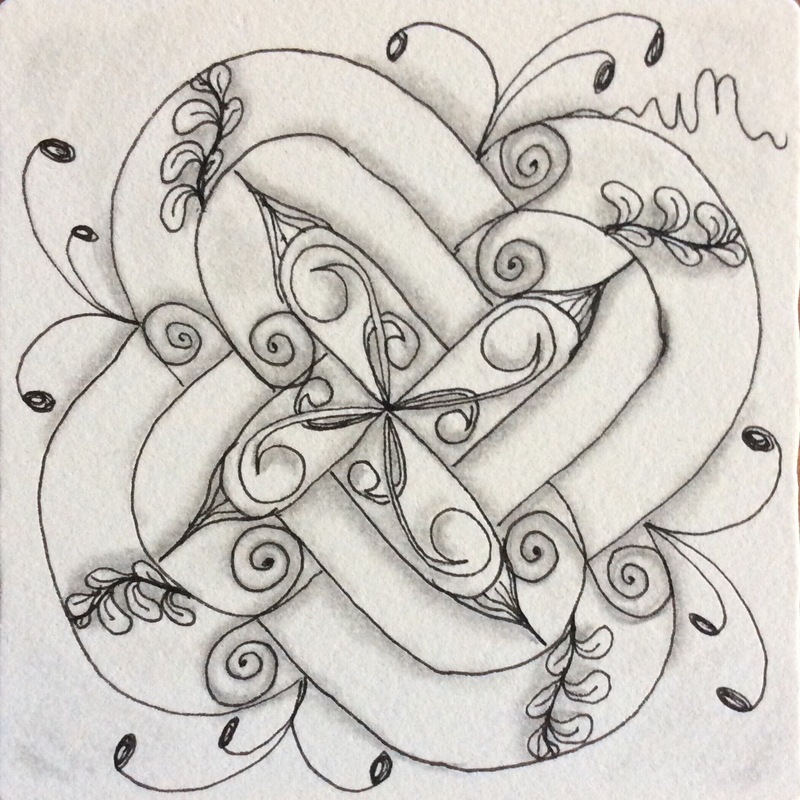 I am still “un-learning” some of those habits as I tangle more and more on official Zentangle tiles and less and less on the cheaper tiles or even my sketchbook. The overall effects of my drawing on the cotton paper seems more finished and less amateurish. That may be psycological, but between the rich creamy color of the official tile, it’s texture, and the luxurious feel of the paper, I like my drawing results better. Thanks! You got a slightly better deal than I got! I agree 100% and apprentice tiles are currently about $24.00 for 140 tiles! A great deal! Where are you finding this bargain? I just bought that package on Amazon for $29, and they’re $50 on the official site. Please let me know. Thanks! Wonderful observations and all things I agree with. The original Zentangle tiles are like no other surface to draw on. Thank you, Jody! The more I tangle and the better I get, the more I pay attention to the “little things” about tangling. Some of these discoveries are things I learned from books–especially the Primer–or videos and blogs. Many are things Zentangle Mosaic members have mentioned. The rest are mostly “Aha!” moments. Meeting wonderful and inspirational friends–like you!–in Mosaic has helped me learn faster and gain confidence to experiment. It’s amazing how many questions I didn’t know I had are answered through playing!